Why does "Large Vertical Totals" Improve quality of Blur Reduction? NOTE #2. This only affects monitors that can do instant mode (unmodified dotclock) straight to the LCD panel. The most popular monitors supporting this FAQ are currently BenQ/Zowie gaming monitors. But why does it help Motion Blur Reduction strobe backlights? 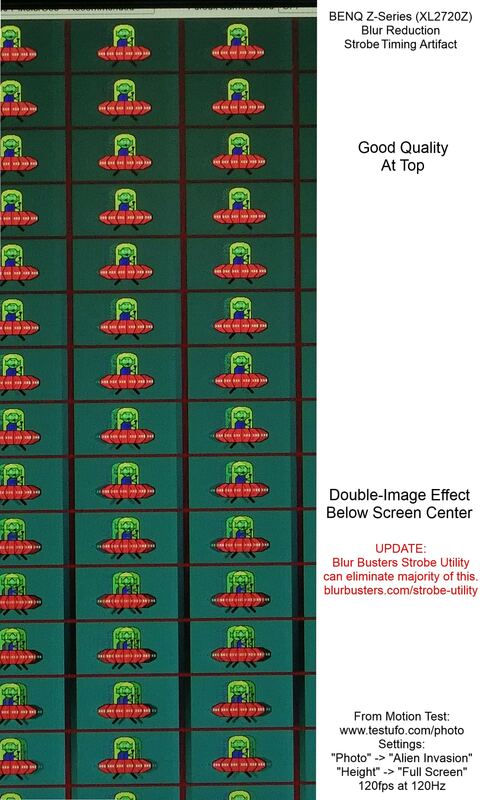 Why do Large Vertical Totals reduce/eliminate the double-image effect (strobe crosstalk) during Blur Reduction? Large Vertical Totals are achieved by loading a Custom Resolution Utility (usually ToastyX CRU) to increase the size of the vertical blanking interval (Vertical Total equals the size of vertical resolution plus the size of vertical blanking interval). It can improve the quality of Motion Blur Reduction on certain monitors -- most particularly strobe backlights of BENQ Blur Reduction or BENQ DyAc, and a few others. Motion Blur Reduction is accomplished via the use of an optional strobe backlight mode to produce CRT-clarity motion on gaming monitors (e.g. ULMB, LightBoost, BENQ DyAc, etc). One factor is caused by LCD pixel response limitations (GtG -- grey to grey -- the transition of an LCD pixel from one color value to a different color value -- which takes time). However, this can be solved on some displays, as several monitors have managed to go almost completely strobe-crosstalk-free. This is successfully accomplished by putting most of LCD GtG response in total darkness, unseen by human eyes (between strobes). This situation requires LCD GtG to be much faster than a single refresh cycle. To see how this is successfully done, read further. The common method of "strobe-phase" adjustment ("Area" setting on new BENQ monitors) by end users -- one views a full-screen pattern such as TestUFO Strobe Crosstalk while adjusting. The strobe-crosstalk double-image zone moves upwards and downwards -- strobe crosstalk affects a different part of the image. The most common situation is to adjust until the screen looks clearest (especially screen center). Some monitors permit this adjustments, such as most new high-refresh-rate BENQ/Zowie gaming monitors. They now provide a 100% fully user-adjustable strobe phase setting (called "Area", usually via Service Menu) on all their new strobe-capable gaming monitors. Earlier monitors (e.g. XL2720Z) are adjustable via Blur Busters Strobe Utility. Tip: Double Image effects can also be caused by framerates lower than stroberate -- aka double-strobing a frame, either via monitor limitation or via running framerates lower than refresh rate. This is not strobe crosstalk. Other monitor manufacturers double-strobes at certain (usually lower) refresh rates forcing a double-image effect above-and-beyond strobe crosstalk. Strobe crosstalk is different: A double image effect being caused by only one flash per frame -- strobe-crosstalk creates double images because of strobe backlight flashes occuring during incomplete LCD GtG transitions. To understand how Large Vertical Totals can reduce strobe crosstalk, it's time to watch a short high-speed-video. - Refreshes on an LCD panel are painted onto the panel top-to-bottom. - Most strobe backlights attempt to flash between refresh cycles -- after letting LCDs finish transitioning (that pixel response, LCD GtG!) in total darkness. This is a high speed video of http://www.testufo.com/flicker running in full screen mode. That pattern is chosen because it is much easier to see the LCD refreshing mechanism via high speed video. That 'fuzzy zone' that wipes from the top to bottom, is the LCD GtG zone -- at approximately 1ms pixel response, the blurry LCD GtG zone is about 1/8th the height of a 120Hz (8.3ms) refresh cycle. If the monitor flashes the strobe backlight while the LCD GtG zone is in the middle of the screen, you get strong strobe crosstalk like the above "Double-Image Effect" diagram above. However, on many monitors, the time delay between end-of-scanout (previous refresh cycle) and begin-of-scanout (next refresh cycle) is much less than LCD GtG. This means that the LCD GtG zone can wraparound to the top edge of the screen -- the blurry GtG zone can overlap the bottom edge and top edge of the screen! A Custom Resolution Utility is built into NVIDIA Control Panel (Custom Resolution) as well as AMD too. However, for creating Large Vertical Total (that properly 100% bypasses GPU scaling), we recommend the use of ToastyX Custom Resolution Utility. It is usually best to use ToastyX instead of the graphics vendor's utility -- as GPU scaling sometimes internally overrides the Vertical Total. It gives you the equivalent of an airplane cockpit's view of creating a custom computer resolution, and this is the mechanism that allows you to increase the size of the Vertical Total. 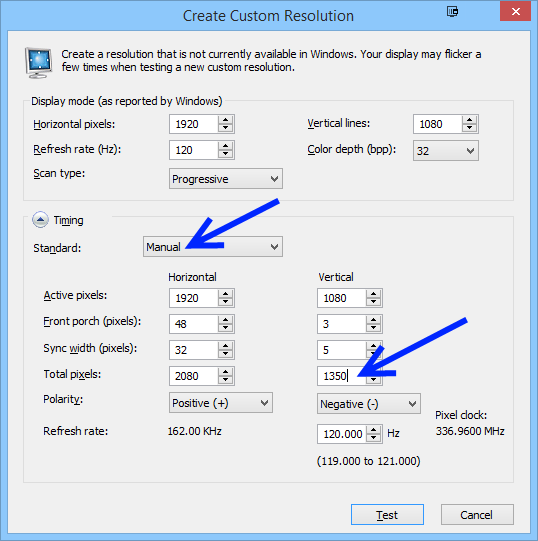 To learn more about these settings, see GLOSSARY: Custom Resolution Utility Terms. But wait! There's a solution to fix that. You accelerate the scanout of the LCD (scan faster) and pause longer between refresh cycles. This gives more time for LCD GtG to finish between refresh cycles, before flashing the strobe backlight. The Zowie XL2720 monitor, for example, supports a Vertical Total of 1350 during 120Hz refresh cycle. VT1350 for 1080p 120Hz forces the monitor to scan-out a 120Hz refresh cycle faster in just ~1/150th of a second ! Instead of closer to 1/120 second! The accelerated scan-out followed by longer pause between scanouts, is what allows the 1ms TN LCD GtG to (mostly) finish in dark between strobes/between refreshes. 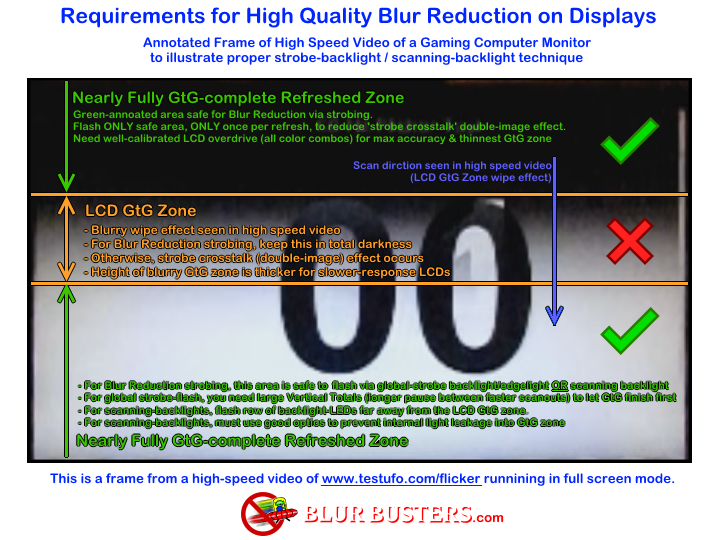 This helps you put the "LCD GtG Zone" more cleanly between refresh cycles. This means you've precisely adjusted the Vertical Total and strobe timing to have the backlight turned off during LCD scanout and LCD GtG response. The strobe backlight is flashed only on a more fully refreshed LCD panel before the next refresh cycle. Avoiding the strobe crosstalk of flashing during incomplete LCD GtG transitions. The screen flickers 120 times a second, like a 120Hz CRT, with none of the normal LCD motion blur. The Large Vertical Total, thusly reduces the amount of strobe crosstalk, by making it much easier to calibrate strobe phase -- you can push the horizontal band of double-image-effect off the bottom edge of the screen before it really wraps around back to the top edge of the screen. If you've seen an old analog TV with a rolling picture, a Large Vertical total is tantamount to increasing the thickness of the black bar between refresh cycles -- seen on a rolling picture of an old analog TV with a mis-adjusted VHOLD knob. In other words, VT1350 gives you an invisible 270-pixel-tall blanking interval before the strobe crosstalk zones wraps around between the top/bottom edge of the adjacent refresh cycle. If the strobe crosstalk zone is not taller than the blanking interval -- then you're able to completely hide the LCD GtG Zone (Strobe crosstalk zone) between refresh cycles! As a rule of thumb, the closer you hit the monitor's maximum refresh rate, the worse the strobe crosstalk becomes. Reduced Blanking is extremely bad for strobe crosstalk, so it is recommended to choose a refresh rate lower than the monitor's maximum refresh rate, for best-quality Blur Reduction operation. 8. Not all monitors support large vertical totals. Please note this trick doesn't work on all monitors. It requires the monitor scaler to support real time scanout (instant mode) from the video signal. Not all monitor scalers do. Supported monitors include most 144Hz+ BENQ/Zowie gaming monitors with Blur Reduction, including Dynamic Acceleration (DyAc), XL2720Z(version 2+), XL2420Z, XL2411Z, XL2420G, XL2735, XL2540, and XL2546. For LightBoost/ULMB monitors -- NVIDIA already automates the operation of Large Vertical Totals in ULMB and LightBoost -- by having the monitor partially buffer a refresh cycle and then outputting an accelerated scan-out to create the longer pauses between refresh cycles. This makes it easier for users, who can just turn ON/OFF the Blur Reduction mode. NVIDIA licenses these technologies to monitor manufacturers as part of GSYNC Monitors. They are very easy and wonderful technologies with easy one-button enable, often with better strobe-optimized overdrive. However, simply having a monitor be compatible with Large Vertical Totals, and then providing strobe timing and strobe phase settings -- does makes it much easier for monitor engineering. Multiple multiple manufacturers are able to release sufficiently reasonable-quality Blur Reduction that can be then calibrated by end users for better quality. It is less automated, increases user complexity, but often supports more refresh rates (in 1Hz increments) with more user choice. A possible intermediate step to make this even easier for users, is future calibration software (possibly included with colorimeters) may be able to automatically create compatible Large Vertical Totals and automatically calibrate strobe timing/phase to approximate optimum settings. Did you know? FreeSync / VESA Adaptive-Sync / HDMI 2.1 VRR -- variable refresh rate is achieved via varying the size the blanking interval between refresh cycles. Basically, a variable Vertical Total that changes every refresh cycle. NOTE: This will soon be converted to an official BlurBusters.com article. I do need to add that certain refresh rates will not play well with certain vertical total values due to some internal scaler stuff. This was first found by Masterotaku; problems that can arise are moving scanlines, frameskipping, pulsating backlight, and so on. Usually just raising or lowering the VT by 1 point, maybe a little more can fix this. Example: VT 1350 works at 120hz very well. 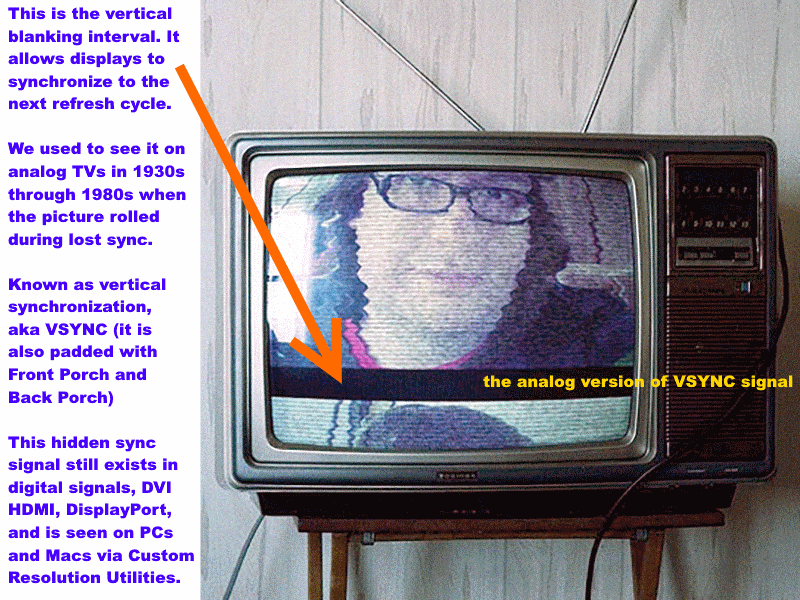 However it frameskips at 100hz quite often; VT 1354 is much more stable at 100hz. At 85hz (some people may want to use 85hz if they can't maintain 100hz/100 fps with vsync on in some games, but CAN maintain 85 fps), VT 1350 works fine, but only VT 1501 works well in the "high" (1497-1502) range; all others will frameskip extremely often. At 120hz, VT 1500 is more reliable than VT 1502. Is this VT tweak a waste of time on the ancient VG278H? Dew wrote: Is this VT tweak a waste of time on the ancient VG278H? Not at all if your monitor supports back light blur reduction and your VT can be modified. It's not too common but it does work on Benq monitors. Very interesting. I have noticed that NVIDIA with ULMB handles cross-talk better than BenQ natively. You have to tweak the VT with BenQ just to get it to ULMB cross-talk minimization, and like you said, at a lower than maximum monitor refresh rate. Vega wrote: Very interesting. I have noticed that NVIDIA with ULMB handles cross-talk better than BenQ natively. You have to tweak the VT with BenQ just to get it to ULMB cross-talk minimization, and like you said, at a lower than maximum monitor refresh rate. That said, the best-tweaked BENQ/Zowie (at same refresh rate) has less strobe crosstalk than many ULMB implementations. NVIDIA generally does a great job with advanced strobe-optimized overdrive (that even includes Y-axis, to make overdrive more aggressive at the bottom edge -- because there's less time to finish LCD GtG before strobe backlight flash). But I've seen well-calibrated BENQ monitors (proper Vertical Total, proper strobe phase, proper strobe length) -- at same refresh rate, e.g. 100Hz or 120Hz) have less strobe crosstalk in the center 3/4th of the screen than ULMB monitors (even if the bottommost 1/10th of screen may be worse than ULMB -- the very bottom 1 inch of monitor). Getting a BENQ to look this good, often takes an hour or more of manual calibration (VT tweaking, strobe phase tweaking). While with NVIDIA, it's just pushbutton-easy. What currently sets NVIDIA and BENQ apart is that BENQ lets you strobe at any refresh rate (albiet several of the monitors single-strobes at 60Hz). For example, if you want strobed Quake at 125Hz, you can. Or if you want to play 75fps@75Hz single-strobe. Or if you want to tolerate more strobe crosstalk, go closer to monitor's maximum refresh rate. Or if you want to reduce strobe input lag, then increase the crosstalk at bottom edge in order to reduce input lag for screen centre. BENQ at least gives you that flexibility of this complex adjustment. Etc. On the BENQ, basically the strobe crosstalk gradient has a different linearity than the ULMB implementations. For example, the LCD GtG zone is slightly thicker, and has a different gradient of crosstalk intensities. There's no Y-axis component in BENQ's simpler most-strobe-optimized overdrive (AMA High) but what's important is the screen centre actually has less strobe crosstalk than ULMB. NVIDIA's strobe overdrive is better, but forces you to a wall garden of 85Hz, 100Hz and 120Hz ULMB with fixed strobe crosstalk intensity. Sometimes successfully calibrated to have MUCH, MUCH less strobe crosstalk than ULMB (at low refresh rates) -- if you're using VT2000+ at 120Hz on one of the 240Hz BENQs. Certainly the colors might be poorer than ULMB (a 1/240sec scanout at 120Hz, will inherit the color quality of 240Hz, instead of 120Hz -- overkill-league faster scanouts like that are usually poorer color quality with greyer blacks). But at least, you've got the option to be better than ULMB in strobe crosstalk. And on that topic, 1/240sec scanouts at 120Hz means strobe flash can come a bit sooner -- reducing strobe input lag to be less than ULMB too (without a dreaded center-of-screen crosstalk zone). You can even intentionally adjust strobe phase for less input lag -- e.g. increase crosstalk at the bottom edge (centre still perfectly clear) for even less input lag without being noticeable in most gaming. There might be faster delivery of frames to the monitor's framebuffer (reducing LightBoost input lag). It wouldn't overide the fixed strobe phasing or fixed (internally-accelerated) scanout velocity that LightBoost already overrides. However, Large Vertical Totals in theory accelerates delivery of refresh cycles to the monitor. Instead of a 120Hz refresh cycle taking 100% of a refresh cycle to deliver, you could deliver the 120Hz refresh cycle to the monitor in 1/150th second. That would make it possible for the LightBoost strobe to flash approximately 1.7ms sooner -- reducing input lag by 1.7ms. I plan to do a highly accurate input lag tests to test the theory that Large Vertical Totals might be able to slightly reduce ULMB/LightBoost lag (even if it doesn't override strobe phase/timing). SMTT-type lag tests isn't precise enough for definitive conclusions on this type of test, since SMTT works poorly with strobing. A lag-differential test on ULMB/LightBoost lag changes of sufficient accuracy can be done with an oscilloscope which I have. Chief Blur Buster wrote: I plan to do a highly accurate input lag tests to test the theory that Large Vertical Totals might be able to slightly reduce ULMB/LightBoost lag (even if it doesn't override strobe phase/timing). SMTT-type lag tests isn't precise enough for definitive conclusions on this type of test, since SMTT works poorly with strobing. A lag-differential test on ULMB/LightBoost lag changes of sufficient accuracy can be done with an oscilloscope which I have. Highly interesting thread, I read it completely. I was wondering if since then you had the occasion to do further testing with ur oscilloscope to find out if increasing the VT still has some positive effects on the input lag with ULMB even though it does nothing to the crosstalk, unlike BenQ's monitors. ULMB is very picky about the dotclocks you use -- monitors with 85Hz, 100Hz and 120Hz ULMB that are flexible with the ULMB tricks (e.g. 60Hz ULMB tricks) are the easiest ones. So one uses the 100Hz ULMB timing to create 85 Hz ULMB (+ large VT) with lower-lag than native 85 Hz ULMB. Or even, the 120 Hz ULMB timing to create 85 Hz ULMB. For this, 85Hz ULMB using 120Hz ULMB timings would technically have approximately a ~1.5ms lag savings for screen centre, and ~3ms lag savings for screen middle. Maximum possible bottom-edge input lag savings from faster scanout = (1/85sec - 1/120sec) = ~3.43ms less lag for bottom edge. You're essentially creating a lower-Hz ULMB (e.g. 85Hz) signal from the full-Hz ULMB dotclock (e.g.120Hz) to hack a "QFT" onto ULMB. This is the lag savings from faster scanout. Unfortunately flexible VT's are out of the question when it comes to trying to increase VT's at the highest-Hz ULMB -- this is a monitor firmware restriction. So you can't reduce strobe crosstalk of higher-Hz ULMB, because you're already at the maximum allowable pixel clock. NVIDIA puts some rather severe restrictions on the dotclock of a signal for ULMB, so there's no "Quick Frame Transport" (QFT) style tricks possible manually. This would be a suggestion to NVIDIA to add QFT (Quick Frame Transport) capabilities to ULMB to help reduce ULMB lag. (The new lag-reducing HDMI 2.1 "QFT" protocol is also essentially achieved via an equivalent of Large Vertical Totals too).